We met a couple on our Japan trip last year. We clicked, we talked, and we ended up exchanging contacts so that one day we could meet up again back home. Since J and K’s drama class was off on May 1st, we took this opportunity to visit our new friends who live in Seremban – an hour’s drive from Kuala Lumpur. The distance makes it a perfect place for a day trip. The main objective of the trip was to meet up with our friends. However, since my wife and I had not really visited Seremban in detail, we took this opportunity to get to know this place more thoroughly. After doing my homework online, both for foods to eat and places to visit (I tried to strike a balance between what interests the kids and the parents), we started our journey at 9.30am after breakfast at home. WARNING: One thing that I was utterly disappointed with Seremban was the road signs. You won’t see the road signs you are looking for until you are about to reach the destination. And I am talking about places of interest (for example State Museum and Seri Menanti Royal Museum). I hope the relevant authorities will get the act together and fix this problem immediately if they want to attract tourists, both local and abroad. Right after we exited at Seremban exit of KL-Seremban Highway, the first thing we did was to visit the State Museum because it is located near to the exit. This place is also called Cultural Arts Centre. Visitors are supposed to make a U-turn at a traffic light to reach the place. 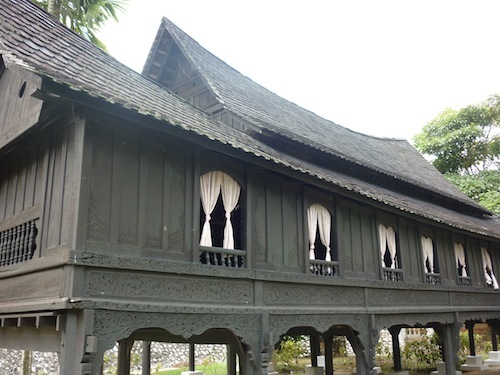 Besides the State Museum, within the same compound, one can take a closer look at the actual “Rumah Minangkabau” or Minangkabau House and Istana Ampang Tinggi. The buildings there reflect Minangkabau architectural design. Notice the buffalo horns design on the roof. The two-storey museum is not as big as what I expected. It has info about the history of Negeri Sembilan, its district leaders, wedding customs, stamps collection, and a human skeleton. Later we met our friends at the State Museum. From there, we went to Kemayan Square – which is located just next to the State Museum – for a beefy lunch. Address: Jalan Sungei Ujung. Seremban exit of Kuala Lumpur-Seremban Highway. Take a left turn after toll and keep right. After about 200m, make U-turn at the traffic light (you have to make sure it is legal to make a U-turn there). The State Museum is on your left, about 100m from the traffic light. I have heard so much about this popular dish that is synonymous with Seremban. But in the past, I did not know where to go and I had no friends that could guide me to the right place. 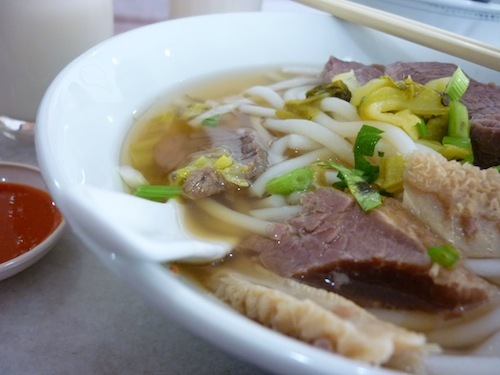 The well-known beef noodles started in Seremban Wet Market’s top floor many years ago. And they are still there until now. Over time, they have branched out to other places as well. Our friends brought us to the Kemayan Square outlet. 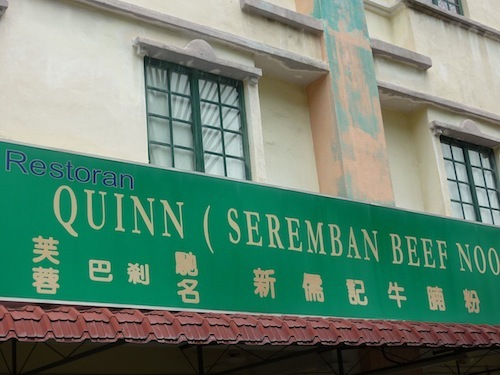 It is called Quinn Seremban Beef Noodles. We ordered one bowl of dried beef noodle and beef noodle soup respectively. The dried ones are more popular and they are more delicious. By the default, the noodle used is “lai fun” though you have a choice of other types of noodles. As a side dish, our friends ordered a bowl of beef ball soup. Two words to describe the famous Seremban noodles: tender and delicious. We will come back for more for sure. Prices: Not sure as our friends bought us lunch. Probably around RM3.50 a bowl. Edit: Later I was told by my friend it was RM6.50 a bowl. 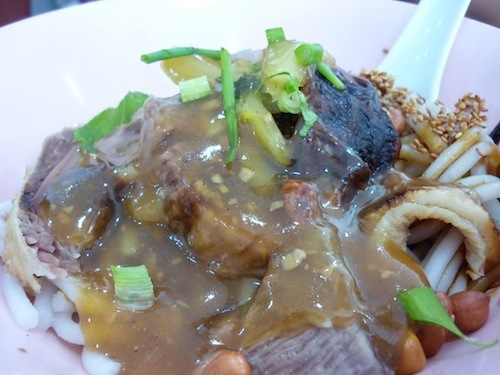 You can also have it at Seremban Wet Market – Sin Yee Kee Seremban Beef Noodles (Stall 748). While having lunch, I lightly mentioned about another popular food outlet in Seremban (which I found during my research). The friendly couple quickly offered to take us there. Sweet. In no time, we found ourselves in this unique green corner building on Jalan Yam Tuan savoring cool, sweet Malaysian dessert: cendol. Cendol is best enjoyed on a hot day. It is a popular local dessert made from pandan (screwpine) leaves, red beans, shaved ice, coconut milk, and gula Melaka (palm sugar). 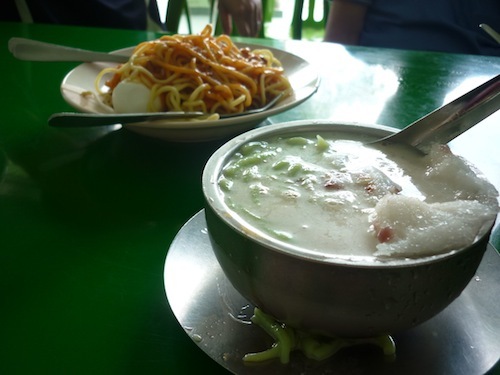 There are a few variations of cendol: usual, red beans, pulut (glutinous rice), sweet corns, or combination of all. Each bowl costs RM1.50. Besides cendol, one can also order mee rojak and rojak. Opening Hours: Close on Fridays and fasting month of Ramadan. A visit to Seremban is not complete if you don’t try its famous siew pau (baked buns). Siew pau is crispy on the outside while juicy and soft on the inside. You have a choice of filling of chicken or pork. But the latter is more popular among customers. The couple recommended us to their favorite outlet: Siew Pow Master. Our friends told us this is where the locals go when they need to get their siew pau fix. I remembered I came here once many years ago. 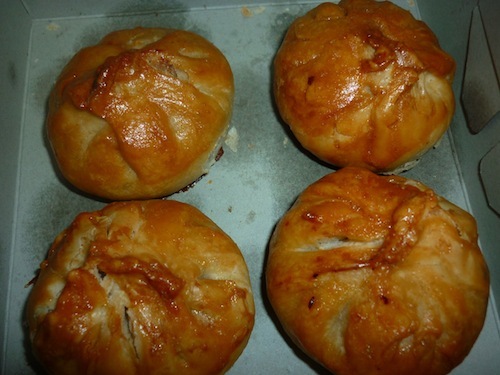 The siew paus here are hot and fresh as they are baked daily… and they are snapped up very fast. Price: RM1.30 each. The bakery shop is crowded and parking can be a problem there especially on weekends. Of course, other pastries are also available. After we loaded our car with boxes of siew pau, we went to the host’s house in Taman Seremban for a while. Later, we moved on with our plan ourselves. Note: There is a popular “loh shee fun” shop opposite this siew pau shop. We didn’t have time to try it out. Check out Restoran Yi Poh while you are there. 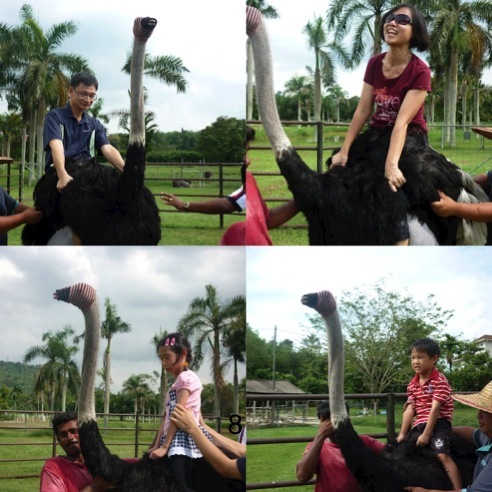 Yet again, we missed the turning to this pioneer ostrich farm in Seremban. The reason? Poor road signs. Not only that. The road leads to the farm contributes to more confusion. The problem is that you will only see signboards after you are almost there! That defeats the purpose of having road signs when the only objective is to guide road users to the right track. There is no proper parking provided by the management of the farm. The only place you can do that is along the roadside fronting the entrance. I wish the management would consider building a proper parking for the comfort of the visitors. I can’t imagine how this copes during peak periods when buses of students come visit. Not only is the road sign small, there is something wrong with it. Can you tell? 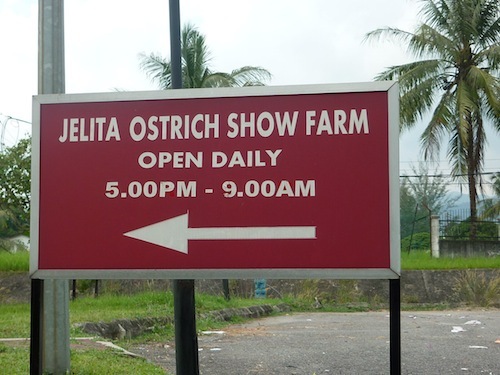 Actually, Jelita Ostrich Show Farm is located right next to Veterinary Department. After you pay for the entrance, you’ll be given a guided tour. Basically you take a walkabout tour around the farm. First, you will be greeted with baby ostriches then followed by adult ostriches. Don’t be deceived by its age. One year old baby ostriches can be as big as full growns. Next, you will be given the chance to stand on two ostrich eggs. Do you know that an ostrich egg can stand a weight of up to 200 kg! So unless you are that heavy, you won’t break the eggs. Eggs are available for sale there. The guide told us you can cook ostrich eggs just like chicken eggs. We didn’t buy. TIP: This is given by the guide. To protect yourself from being attacked by ostriches (they pierce victims with their toes), grab and hold a pole (bamboo or branch) that is taller than ostriches with you. Ostriches would think that the pole is an animal that is taller than they are and they tend to stay away from them. Following was the highlight of the visit – the ostrich ride. 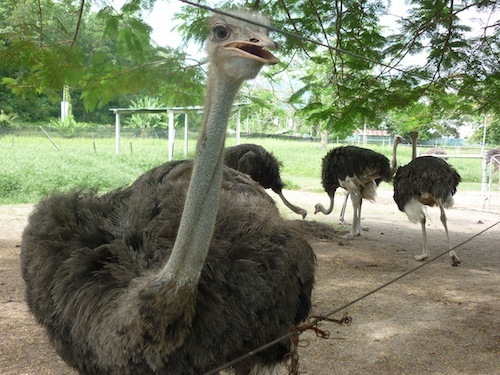 Before visitors are allowed to ride on it, the ostrich is blind-folded so that it won’t run or simply walk around because that can be scary for first-time riders. The ostrich will only walk with the guidance of people when they are blind-folded. The trick to riding an ostrich is to hold on with both hands to the inner parts of the wings and sitting on the back of the ostrich. You have to lean backwards to create balance in your ride. I thought J and K were scared. But in the end they braved themselves to try out this hard to come by ride. I was amazed by their courage. There is a reward if you dare to take up this challenge. A certificate will be given to you after each successful ride. After the ride, we moved on to the race course. Not what you see in horse racing field but of smaller scale. 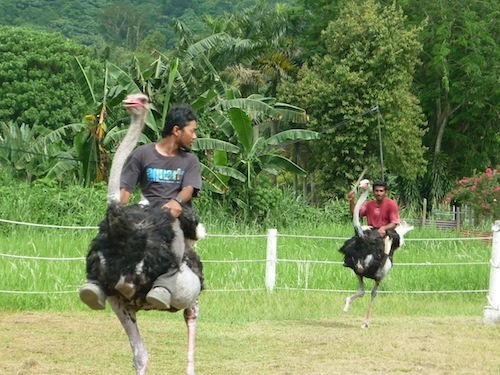 Just like horse racing, riders will sit on ostriches and race. The “jockey” will guide the ostriches by covering the eye when there is a turning in front. Not many, only two ostriches in the race. Before you end this unique tour, you can get yourself or your friends some souvenirs from the shops on the farm. If you are the adventurous type, you can even get ostrich meat (RM60/kg). There should be ostrich satays for sale but on the day we went, the stall was closed. We had a quick picnic outside the ostrich farm before continuing with our trip. Entrance fees: Adults RM8. Children RM6. After visiting Seremban Ostrich Farm, we continued with our last item of the day trip: Seri Menanti Royal Museum (Istana Lama Seri Menanti). 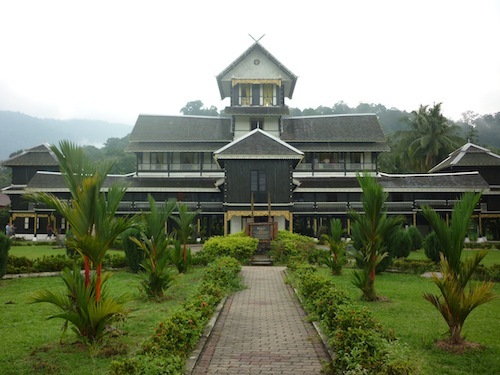 The palace-converted-to-museum is located along the way to Kuala Pilah, some 32 kilometers away from Seremban town. On the way, you will pass through a stretch of hilly road, so beware. Oh not again!? Yes, it happened again. I almost made a U-turn back to Seremban town because there are no road signs for this tourist attraction in sight until I almost reached the turning to the royal museum. Anyway, luckily I pressed on and did not turn back. Not long after, I saw the signboard leading to the destination we wanted. The surrounding area was beautiful, peaceful, and exhilarating. Though it was drizzling that day. I was told by one of the staff there this palace was used by Negeri Sembilan ruler (the royal highness is called Yang Dipertuan Besar Negeri Sembilan) until 1930’s. After which the royal family moved to a new palace in Seremban. Also the ruler has another palace built next to this very Royal Museum – mainly for official functions. In Seri Menanti Royal Museum, one can have a peek inside the life of the royal family – how they conducted their personal lives and belongings. Right from dining room to bedrooms, from entertainment hall to kitchen. Also you can feast your eyes on a personal collection of photos and weaponry of the royal family. There are four stories in total and you are allowed to climb up Seri Menanti Royal Museum for a closer look. Be careful when you reach the top floor as the staircase is very steep. Through the balcony, you can have a nice look at the spacious garden in front of the museum. How to get there: From Seremban, head for Kuala Pilah. 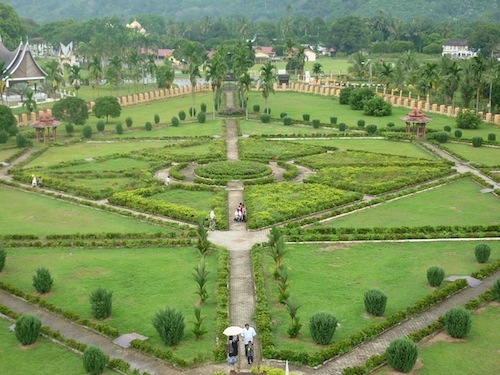 After about 20 minutes’ drive from town, you will see a road sign leading you to Seri Menanti Royal Museum. Keep driving until you need to make a right turn. Drive another 3 km to reach the Royal Museum. After reaching the modest Seri Menanti town, take a right turn again.